I was disappointed not to run a London Good For Age qualifier last year but I was over the moon to be successful in in the ballot, it’s a rare occurance! Last Spring, the Rome Marathon didn’t quite go my way so I made a last minute decision to enter Manchester 2 weeks later. I ran better in Manchester, but it was tough knocking out that kind of distance again so soon and I believed myself when I swore I’d never attempt such a thing again. Not expecting a place in London I had already entered the Brighton Marathon, but October rolled around and I came home to the coveted ‘You’re In’ magazine on my doormat…pain and consequence long forgotten, I wanted to do both. Obviously. The London Marathon is hands down the best day of the year and if I’m not running, there’s nowhere I’d rather be than cheering on the sidelines. 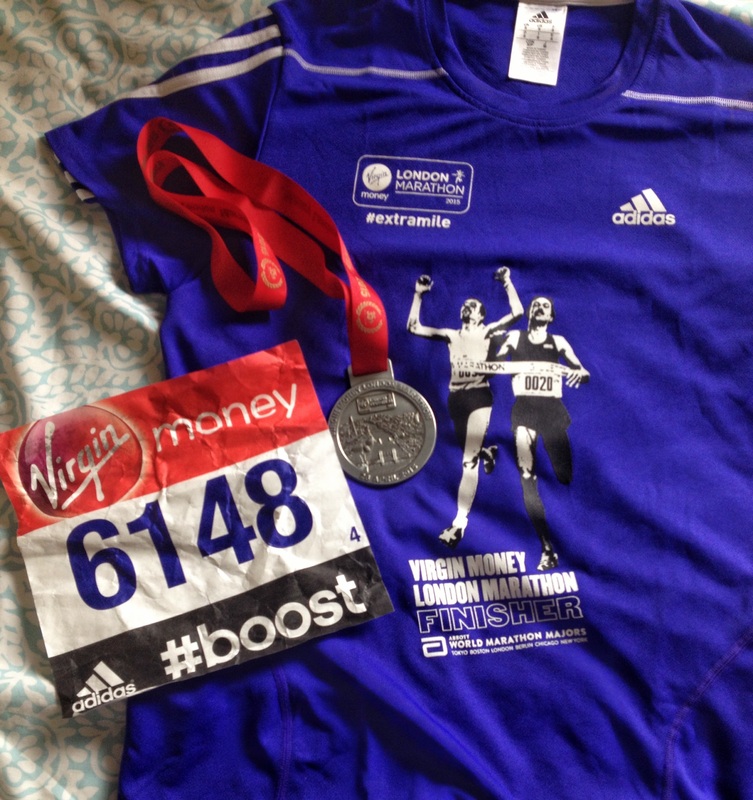 I first ran London in 2011, it was my first ever marathon and is completely responsible for giving me the bug. In 2013 I qualified for a GFA entry, I went off way too fast and suffered in the later miles, it was a tough run. This year I really wanted to enjoy London for the spectacular 26.2 mile street party it is and I didn’t want my over ambitious dreams to ruin my enjoyment. The only way I could guarantee that was to make Brighton my A race because I really can’t be trusted! I’ve been in limbo the last 2 weeks, it’s odd trying to strike a balance between recovery and taper and in a shockingly sensible approach I simply listened to my body. There was a bit of running, a lot of rest, a lot of early nights and a lot of hand sanitizer, I was really fun to be around. On Sunday I woke up to the best good luck message ever! It immediately put me in a good mood despite the 5.45am alarm, how could it not be a good day? I was sooooo excited! It was actually pretty cold when we got there but there wasn’t too much waiting around after a couple of trips to the toilet and dropping off our bags. I met up with Laura who was in the same start pen as me and then it was time to line up. Whhhaaaaa, good luck!! I usually know exactly what I’m going to do on marathon day – what my goal is, what my back-up goal is, what pace I’m going to start at, what I’m going to do if, if, if… What was different about today was that I didn’t have a game plan. I really didn’t. Today I was going to turn up at the start line and see what my legs would let me do. 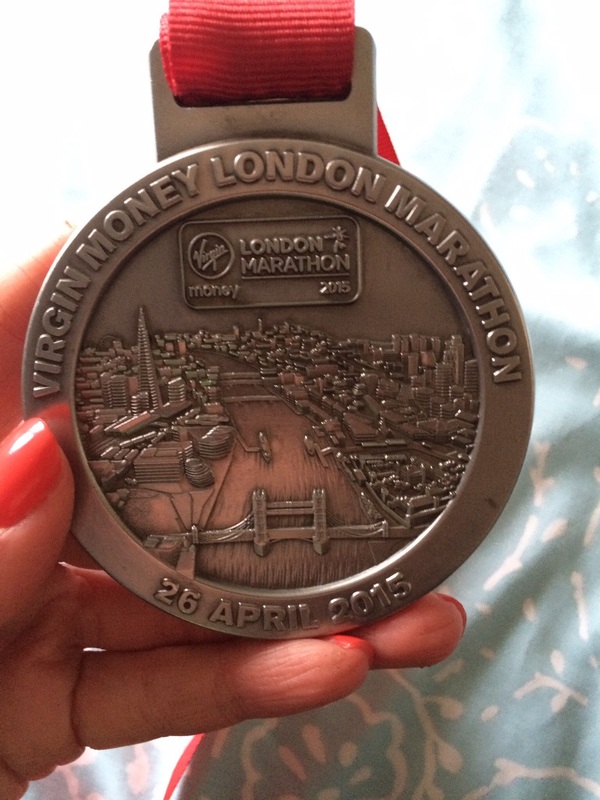 Could I pull off another 4 hour marathon 2 weeks after Brighton? Maybe 4:15? 4:30? A bit slower? In my heart I knew I’d be disappointed at anything over 4:15 but I needed to be realistic that it was a very real possibility, especially if I was going to achieve my ultimate goal of enjoying every second. I wasn’t entirely sure how I would deal with a disappointment though. Suddenly, the gun went off and we were moving forwards! It only took about 2 minutes to get across the line and there we were, running the greatest marathon in the whole world!! 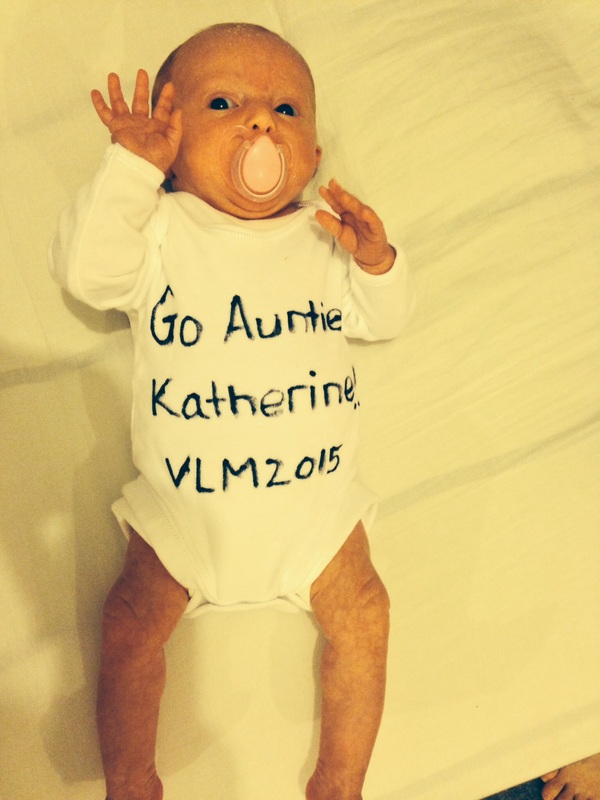 With the image of little Chloe in her ‘Go Auntie Katherine’ outfit firmly in my head, all I knew was that I needed to be able walk away today knowing I did the best I possibly could. I didn’t want to feel like I let myself down and I didn’t want to be embarrassed by my effort. I started off comfortably, I was running under 9mm but wasn’t pushing it. After a few miles I could tell my legs weren’t fresh, but I was still hitting a fairly good pace and I was happy. I remembered to high-5 a few kids and smiled at everyone who cheered me by name. Fun, remember, FUN! By mile 10 I knew I was running slower but it felt much slower than the 9mm pace my Garmin was telling me so I was quite pleased. 9.04, 9.02, 9.04, they kept ticking by consistently, hey, I was doing OK and I was enjoying it! The crowd support is pretty good in the first half, but it really thickens when you get to Tower Bridge between 12 and 13, you really know you’re in London when you turn the corner and see that Bridge! Running across the river is freggin awesome, the atmosphere is buzzing and I remembered to look up and take it all in, I almost forgot we were nearly half way already. My legs hadn’t forgotten though, they were starting to ache earlier than I would have liked…I ignored them. I knew the Chasers would be somewhere around 15 miles and I couldn’t wait to see them, there’s nothing like a Chaser Cheer to give you a boost and I really needed a boost. Luckily there’s so many of them you can’t miss them and they let out a huge roar as I trotted past. 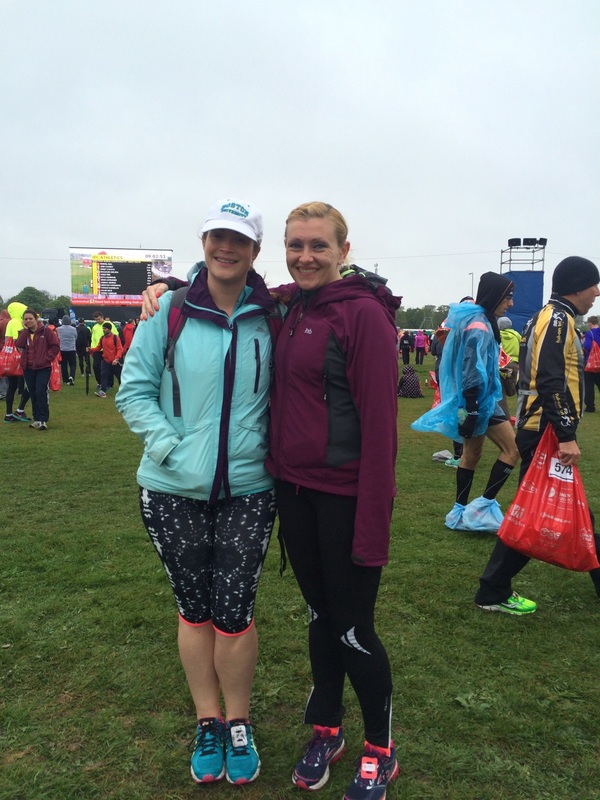 Before I knew it I was at mile 16 and I re-evaluated how I felt, it was getting harder but I was still OK, it was the the flippin London Marathon! I was a bit slower by 18 miles but I told myself I absolutely needed to get to 20 before I could even consider a walk…I kept going. True to my word, my legs made it to 20 miles and I rewarded them with a timed 2 minute walk, trying not to make eye contact with the crowd. They wanted me to run, they didn’t know about the deal I made with my legs, they didn’t understand, ohhh the shame! It’s all mind games after 20 miles. I don’t like 20 miles, it means there’s still 10 whole kilometers to go, I like 21 miles because there’s only 5 miles left…make sense? Of course not! But, by the time I’ve worked out in my head how exactly I feel about having 5 miles left I’m at 22, and, today, that meant another teeny little walk. Don’t judge me. The walk didn’t last long, the crowds just wouldn’t have it, ‘you can do it Katherine, you’re nearly there!’, they didn’t come out to stand on the streets all day to watch me walk. People at home were tracking me, they’ll see my splits. Chloe’s wearing a special outfit, don’t let her down. There’s a sodding TV camera in my face, OK, MOVE. The next few miles were a bit of a blur but I didn’t stop running, I couldn’t, not only was it too hard to get going again, at this point absolutely anyone I knew could be on the sidelines and I didn’t want to be seen walking, it’s the friggin London Marathon! The crowds are totally wild by this point, they cheer and shout and yell ‘go on Katherine, you’re looking awesome!’ Errrm, I’m really not am I, I’ve probably never looked less awesome, but thanks! It was really starting to hurt along the Embankment but my legs were ticking over and I was still enjoying the atmosphere, I just wasn’t sure why the miles were getting longer, why would they do that?! Eventually I turned the corner to face the home stretch along The Mall, it was the best sight ever! The flags were flying high, the crowds were roaring and I could actually see the finish line. Just. Keep. Running. I finally crossed the line in 4:05:52 and was totally overcome with emotion, I don’t know how I got through the last few miles, I just wanted to sit down. Collecting my medal and shuffling along I quietly reflected on what I had achieved. It was slower than Brighton but it was well within ‘you-can’t-be-disappointed-with…’ time. So why was I a little sad? I really didn’t know. It wasn’t a bad time, especially after Brighton, but I have so many fast friends it’s hard not to think you’re a little bit rubbish. I’d really enjoyed the run, enjoyed the atmosphere and loved the Chaser support, it had been a brilliant day. Plus, I genuinely don’t think I could have put more effort in, I couldn’t have tried any harder today, I had to be pleased with that. I slowly made my way to the finisher area to wait for Zoe and hoped she would come in under her target time. When I saw her she looked in much better shape than I did at the finish and was really pleased with her time. I reckon she’s hooked! Then it was a quick turnaround and off to the pub for Chasers marathon celebrations with cider and some sensible sambuka. 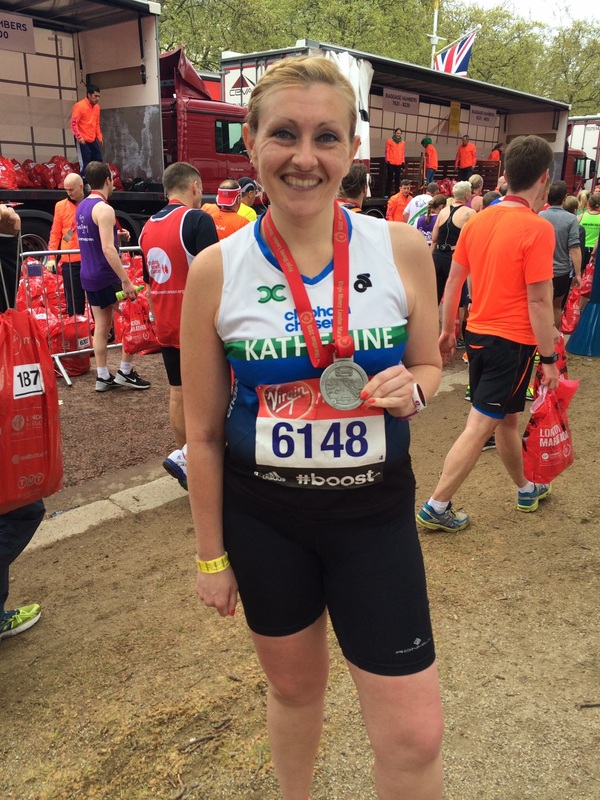 Another weekend, another marathon and another London medal, that’s pretty awesome right?! 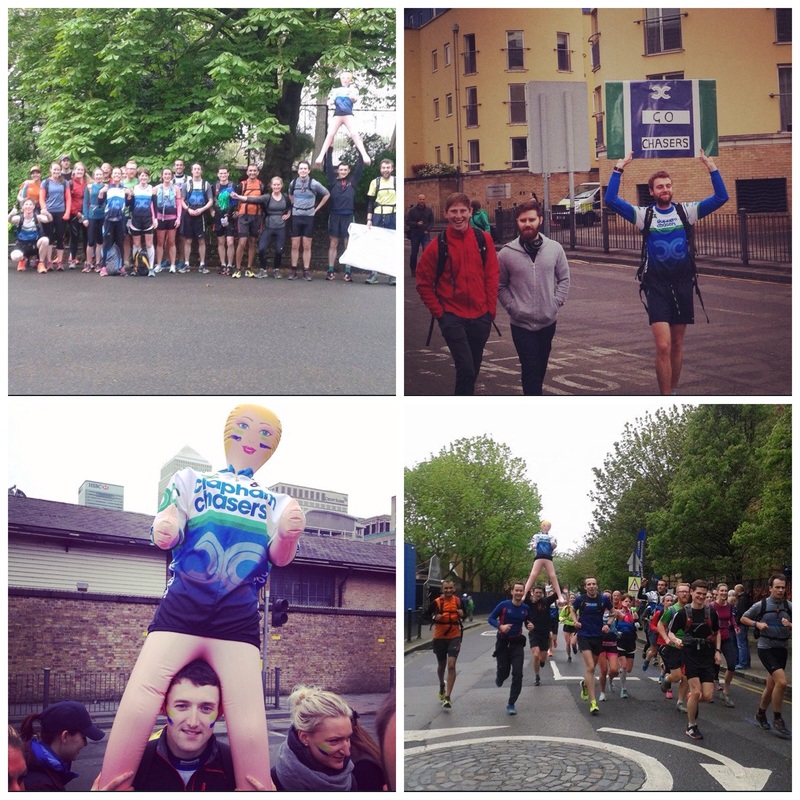 Whatever happens, the London Marathon is always a special day. It won’t be the last time I run it, not a chance. 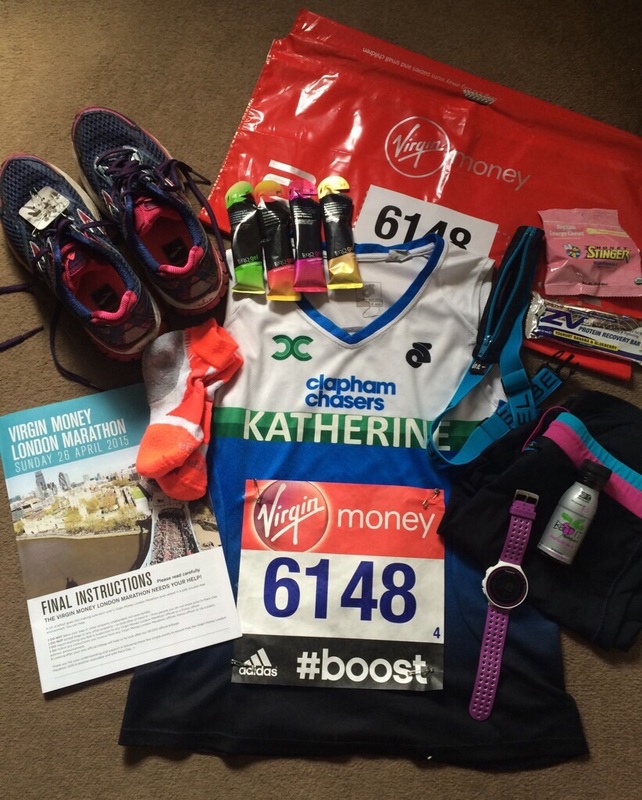 All’s Fair in the London Marathon Ballot…isn’t it? I have to agree that London was my best marathon not just because of my PB but also of the crowds and the atmosphere. Its days like this that really brings London together and the Chasers’ support was better than ever (we need an official supporters club!). To do 2 marathons in 2 weeks is an achievement in itself (I have not even done that!). The main thing is you enjoyed it and you finished with a smile on your face. As you and I know from experience, marathons can easily go wrong mid-race very quickly so be proud of finishing it in the time you did. With every marathon you do, you always learn something new about yourself so when the going gets tough, you know you can dig deep and keep on going because you have done it before even though it feels like a struggle (even for me!). That often gives me more satisfaction than the time itself because I know I gave it 100%. In terms of thinking you are a little bit rubbish – nonsense! There will always be people slower and faster than you (same for me). It took me 9 attempts over 4 years to get a sub-3 but some people did it this year at their first attempt. Does it bother me; not at all. 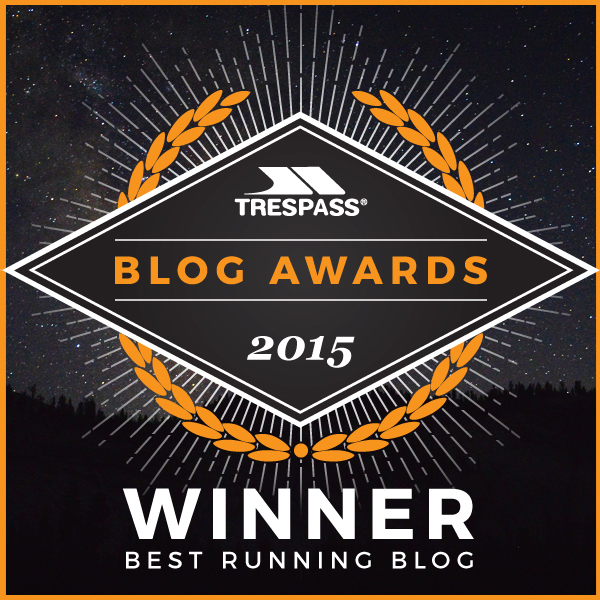 Running is not all about times. Sometimes we get so hooked up on times that we forget about the enjoyment it brings and what it gives you. If you don’t enjoy it, that’s when it really becomes a struggle. Hope the legs are not too sore and that you are enjoying a well deserved rest! Thank you! I would say the London Marathon is well worth a trip over here! I think you’re a lot awesome! Thanks Helen! You’re pretty awesome too for battling through with your injury! Great recap! I would love to run London some day. Congratulations on a great race! Thank you, it’s definitely a special one for me. I hope you get the chance to come over and experience it yourself one day!